Of the more than 800,000 ballots cast in Illinois, about 21,000 of those ballots were cast in Chicago by early Saturday. More than 800,000 votes were already cast three days ahead of Illinois' midterm elections, but candidates continued Saturday to make their last-minute appeals. Meanwhile, former President Barack Obama is planning to stop in Chicago and Gary on Sunday to stump for fellow Democrats. Early voting numbers have been much larger than in previous years, election officials said. Long lines of voters waited to cast their votes early Saturday at many locations, including the Loop Super Site at 175 W. Washington Ave. in Chicago. The Loop Super Site will remain open on Sunday. Politicians from both sides of the aisle are making a final push for midterm election votes over the weekend. Of the more than 800,000 ballots cast in Illinois, about 21,000 of those ballots were cast in Chicago by early Saturday. Early voting numbers were expected to grow even more over the weekend, possibly surpassing those cast in the 2016 election. "We cannot complain about anything if we don't vote. And one vote does count. Every vote counts," said voter Renee Matthews. Voters waited up to three hours to cast their votes at Welles Park. "With everything that's been going on, at least in my adult life, this is the most important time to vote so I just really blocked off the entire afternoon just to do whatever it takes to get it done," said voter Craig Tommey. 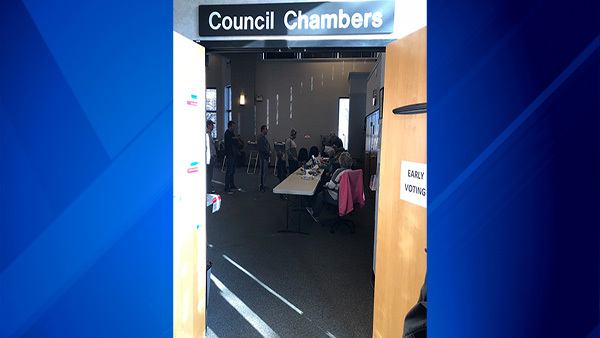 In Elmhurst, voting got off to a rough start as election officials reported computer malfunctions due to a brief power surge Saturday. As of 9:45 a.m., officials reported that the issues had been resolved. Obama will appear at the UIC Pavilion at 3 p.m. Sunday. The former president will be campaigning for Democrats, including gubernatorial candidate J.B. Pritzker, attorney general candidate Kwame Raoul and congressional candidates Sean Casten and Lauren Underwood. He will be joined by Chicago musician, Common. He will also attend a rally at the Genesis Center in Gary Indiana on Sunday. In Gary, Obama will campaign for U.S. Sen. Joe Donnelly. His GOP opponent, Mike Braun, was scheduled to campaign with the president of the National Rifle Association, Oliver North, but due to a scheduling conflict, he could not attend the event in Noblesville, according to an Indiana GOP statement late Saturday. Candidates for Illinois Attorney General met with voters on Saturday just days ahead of the midterm elections. Republican candidates Erika Harold, who is in a tight race for attorney general with Raoul, spent the day in Naperville meeting voters. She was joined by Congressman Peter Roskam, who is seeking re-election to the 6th District against Democratic opponent Sean Casten. Roskam highlighted tax relief and the country's economic gains with Republicans in control. Casten stumped in Lombard, where he talked about Democrats winning back the House and praised residents for their civic engagement. Recent polls show the tightly-contested 6th Congressional District race as a tossup. Voters can register to vote at their polling place both for early voting and on Election Day. Find your early voting site here.